Well, it's happened. Summer holidays are over and school has started. Notice I didn't say "summer" is over. It's not. Even though it feels like fall here today, summer doesn't officially end until next week and I for one plan to enjoy every little bit of it I can still :) It's going to be warm, sunny, and even humid this weekend so I'm not putting away our summer clothes and sandals yet! But, despite what the calendar tells me, it is definitely fall because school has started. And with fall comes new activities, goals and routines. September is kind of like January in that it's a new year. Whether you have kids or not, the school year is a sort of reset. A fresh start. A good time to establish new habits. It's also a very busy time as various activities, clubs, lessons, and sports start up again. 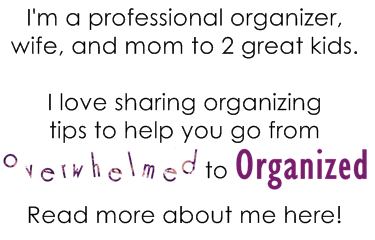 It can be overwhelming if you're not organized. Routines help keep you organized and reduce that overwhelming feeling when you get really busy. Today I want to share some of the ways we're getting organized for fall in our home and give you tips to help you set up a fall routine as well. Kids need school bags, lunch bags, school supplies, books, instruments, and all kinds of other stuff for school. It will end up getting dumped all over the place if you don't have a designated home for it! Find a place that will be easy to remember and easy to access. Then get your kids in the habit of putting their own things away every day when they come home, returning everything to this spot when they're finished with it (homework, school supplies, etc. ), and taking what they need from here every morning on their way out the door. This way you aren't frantically searching for things in the morning or forgetting items that are needed. And you eliminate the pile of stuff that otherwise lands near the door. If your kids are involved in sports, music, or other activities, do the same thing for the items they need for them. Ideally these should be separate places, especially if their activities are not done on a daily basis. Unless the gear is very minimal for the activities, in which case you could combine it with the school gear. It's also great for parents to have a similar place for their "gear" for work and/or hobbies and activities. 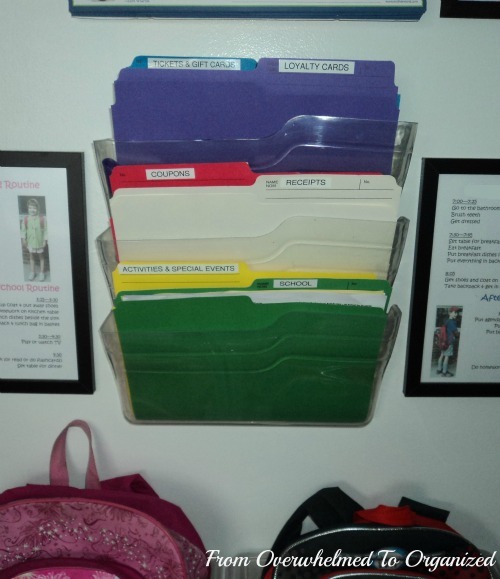 In our home, my kids keep all their school gear in their bins in our kitchen command centre. This is close to our front door, right next to the table where they do their homework, and within arms' reach of the kitchen where they empty out their lunch bags and where we can easily grab them when we make their lunches in the morning. This zone has made our mornings easier, our after school time easier, and we're no longer tripping over bags in the hallway on our way to the bathroom (or rushing to hide them when guests come over). They keep most of their extra-curricular activities' gear in their bedrooms since they don't use it every day. That way it's not cluttering up our main floor the rest of the week. 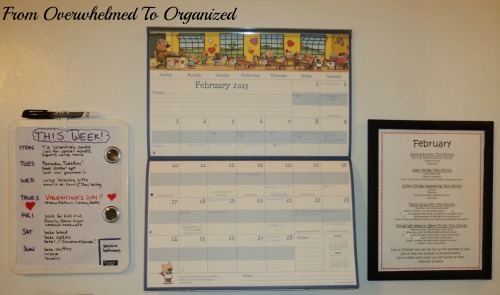 Notices, memos, newsletters, schedules, calendars. They multiply while we're sleeping I think. Find a place to keep everything so you don't have piles of paper cluttering up your counters or table. Many people find having folders works well. You can have separate folders for each child, each activity, or whatever will work best for your family. We keep all our paperwork from school and extra-curricular activities in the wall files in our command centre. My kids both go to the same school right now, so I just have one file for school. And they don't do a lot of extra-curricular activities so one file is sufficient for us for now as well. When they get older I can easily add more folders to this system. My whole family knows that whenever they need to look up something for school or an activity they'll find the paperwork in these files. And it's no longer piled up on my kitchen table :) I go through these folders at least once every month to clear out anything that's no longer needed. My kids' routines are also part of our command centre. We just have morning and after school on here because their before bed routines are pretty firmly established. We update these every fall and sometimes in January as well. One of the biggest reasons families get overwhelmed in the fall is that each person is involved with several different activities, and parents sometimes just feel like a taxi driver getting everyone where they need to be, when they need to be there. And depending on the activity, there are extra things that accompany them... recitals, extra practices, year-end parties, etc. These add even more pressure to an already full schedule. Don't get me wrong... I'm not saying activities are bad. In fact, the problem is that there are so many great things to do. Sports, music lessons, Scouts, church groups, community/cultural activities, dance, and on and on the list goes! 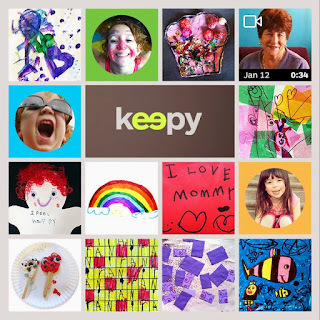 Kids benefit in so many ways from being part of them. But, it's OK to not participate in everything. Our kids usually participate in only one activity per season, and usually have one season "off". This fall my daughter is doing ballet and my son is taking skating lessons. In the winter my son doesn't usually do any activities because he plays baseball all spring and fall. My daughter continues on with ballet in the winter and spring but doesn't do an activity in the summer. 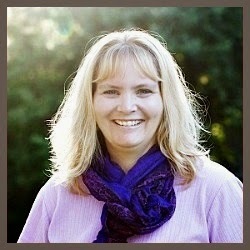 It works for us because we never know my hubby's work schedule and mine varies a lot too. It's too hard to coordinate too many evenings out. And we don't always get dinner together as it is when my hubby works late, so we don't want to have any more evenings where we're eating dinner early. We're making one exception this fall and the kids are taking swimming lessons as well as ballet and skating. They weren't able to do swimming lessons this summer because of my work schedule so I've signed them up for the fall. But I intentionally chose late Saturday mornings so it's not another evening (and late enough that we can still have relaxing Saturday mornings!). You need to choose for your family what a good amount of activities for each person is. Some families allow their children to choose 1 sport and 1 music activity (guitar lessons, etc.) per season. 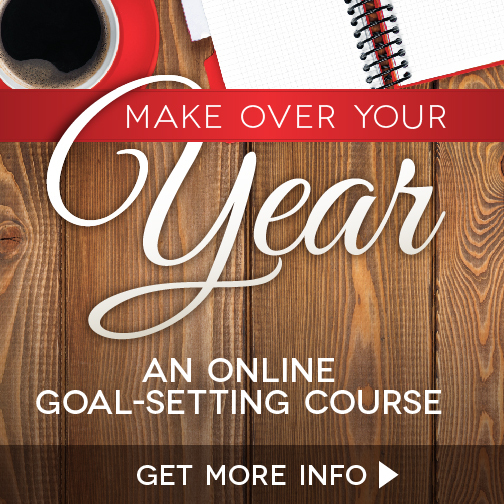 Others work out an annual plan for what each person will participate in. It's different for each family, depending on your kids' interests, your finances, the parents' work schedules and availability to drive family members to activities, etc. Plus, I think the ages of your children comes into play as well. My point is just to be intentional about what activities you do so you aren't as overwhelmed. Don't just say yes to everything without counting ALL the "costs". This is important so everyone in the family knows where they need to be and what they need to do each day. Once you establish a weekly schedule, make it part of your routine to update your reminders list every week so nothing falls through the cracks. As you're setting up a weekly schedule, search out options when you're choosing activities so you can coordinate which evenings you're busy and which ones you're at home. Some families set up their schedule so that only one person has an activity on any given night. Others prefer to have a few busy evenings with multiple activities and then have quieter evenings the other nights. You don't always have control over this, but where possible it's good to set it up so it works for you. I keep track of our schedules and weekly reminders in our command centre. This picture is old, but the system hasn't changed. All our appointments, schedules, activities, and commitments go on our calendar and every week I update our weekly reminders memo board with what's happening that week, what we need to remember, and things we need to do. It's part of MY weekly routine :) And part of my daily routine too. I check this little baby multiple times a day. As you can see, a lot of what keeps me from being overwhelmed in the fall is taken care of in our command centre. There are more details about each element in the posts I've linked to, and you can see all the command centre posts here. I especially recommend the family goals post since September is such a great time to set new goals as a family and not just survive the fall, but live intentionally and thrive this fall! If you need more help creating specific routines (or see other ideas or download printables), I have a ton of ideas on my Routines and Chores board on Pinterest. 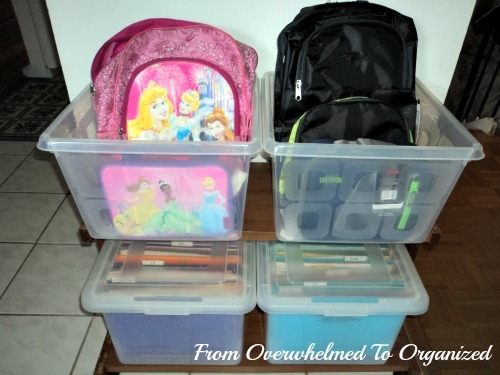 You can also check out lots of great organizing tips on my Organized for School board. I'm not a "fall" person because I love summer so much and enjoying fall feels like I have to admit that summer's over. 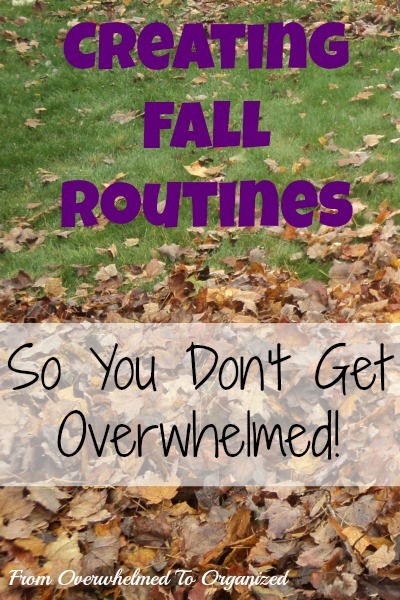 But, I do like setting up our fall routines and trying to work things out so that I'm not creating situations that overwhelm me or my family members. What are your fall routines? 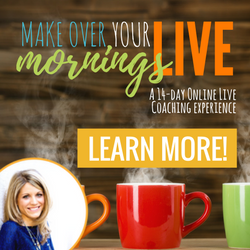 What do you do to keep from being overwhelmed in the fall? How do you decide what activities your family will be involved in? I am loving the book bag storage idea! I was just telling my husband that the chaos of locating the backpack has got to end!! I'm not sure why backpacks always feel so cluttery, but having a good system for them really makes a difference Brandy! These are great tips! Routines are way too undervalued nowadays. The kitchen command center is very nice. I absolutely love all of your advice--but the best part is the--make it a routine! That's the hardest part I think. Thank you for sharing. It's definitely the hardest part, but the most important part too! Good luck with your routines! These are such great ideas. If I don't stay organized during the school year I can easily get overwhelmed. I LOVE your command zone! 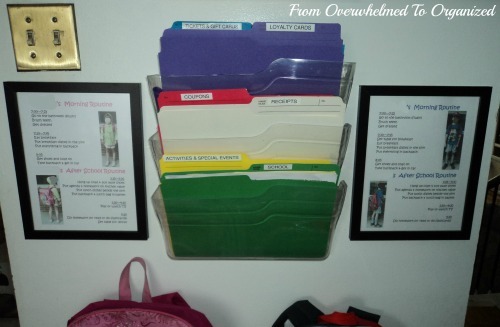 Keeping the kids's files there will keep you SO organized! Thanks Lisa! It's been working really well for us the last few years. I may tweak it a bit this year now that my kids are in different schools from each other. But in general it keeps everything organized!